Insurance group: 15 - 19 How much is it to insure? If you’re one of the few car buyers who laments the rise in SUV popularity and yearns for a more traditional motoring landscape, then rejoice: this is the Honda Civic Saloon. Booted, four-door versions of medium-sized family hatchbacks have fallen out of favour over the past decade, meaning fewer manufacturers bother offering them to British buyers. Highlighting the point, the Civic Saloon has few direct rivals: the Mazda 3 Fastback is the most obvious alternative, but beyond that you’ve got the more upmarket Audi A3 Saloon and Mercedes-Benz A-Class Saloon, the latter of which arrives in the UK in early 2019, or there’s the smaller Seat Toledo. What exactly is the Honda Civic Saloon? It’s very close the the Civic Hatchback. 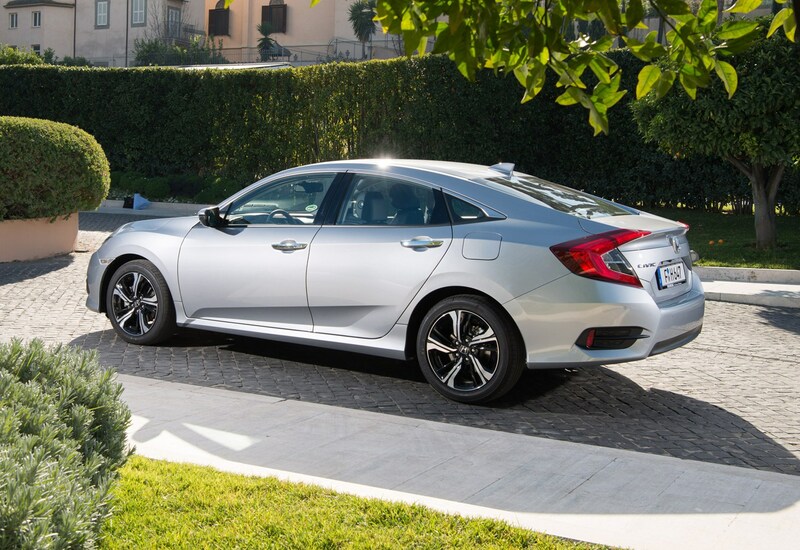 Honda has sold several generations of Civic Saloon in the UK before, the most recent iterations exclusively in fuel-efficient petrol-electric hybrid form. This time around it’s different: gone is the more obvious separate boot shape, exchanged for a much more elegant four-door coupe profile, with a continuous line tapering from the roof down to the tail lights. The effect is that when viewed from a front three-quarter angle the new Civic Saloon is barely distinguishable from its five-door Civic Hatchback counterpart, bar the extra chrome and smaller fake vents on the four-door. The differences are more pronounced at the rear, where the Saloon loses the Hatchback’s central exhaust and huge fake vents, and the boot itself is more pronounced, adding 13cm to the length of the Saloon. 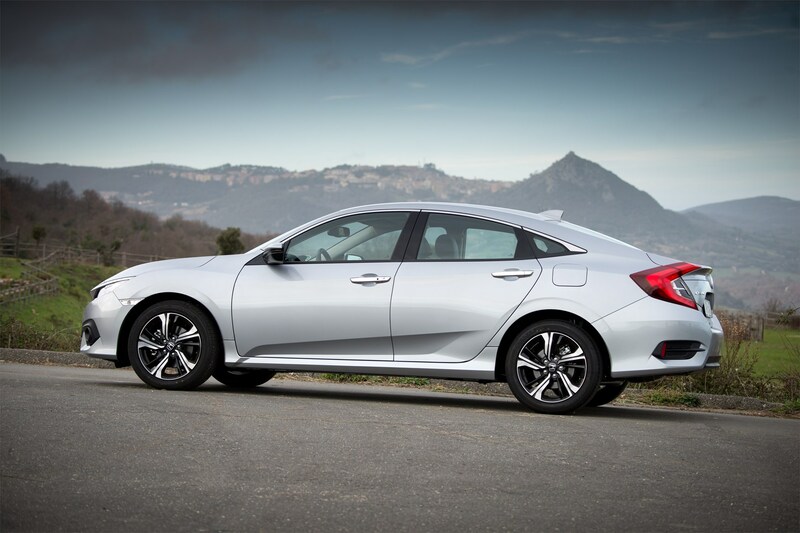 Which engines does the Honda Civic Saloon have? It’s a limited range of engine and gearbox permutations for the four-door version compared with the Civic Hatchback, with one petrol powerplant offered as the alternative to diesel. Petrol fans are served by the 1.0-litre i-VTEC turbo, available with a manual or CVT automatic transmission, while an updated version of Honda’s familar turbocharged 1.6-litre i-DTEC diesel – with the option of a six-speed manual or nine-speed automatic gearbox – is the other choice. The 1.0-litre petrol Saloon in manual form has a top speed of 130mph, while the CVT peaks at 124mph. That compares to 126mph for the manual Hatchback; the CVT hatch matches the Saloon. Acceleration times for the Saloon are slightly faster than the Hatchback in both cases, at 10.7sec for the manual (versus 11.2sec in the hatch) and 10.4sec for the CVT, ahead of the five-door’s 11.0sec. The 1.0 manual’s official combined fuel consumption figure of 58.6mpg is marginally inferior to the Hatchback’s 58.9; the two bodystyles agree on 60.1mpg for the CVT. CO2 emissions are 110g/km for the manual, 107 for the CVT – both the same as the Hatchback. In the case of the 1.6-litre diesel, top speed is 125mph for the manual and 124mph for the automatic, with 0-62mph times of 9.9 and 10.7 seconds respectively. Fuel consumption is a claimed 83.1 for the manual and 68.9mpg for the automatic, with CO2 figures of 91g/km and 108g/km. The manual Hatchback has near identical figures (125mph top speed, 9.8sec 0-62mph, 80.7mpg, 93g/m CO2), and as this is the first time a Civic of any sort has been available with the combination of diesel engine and automatic transmission, there is no directly comparable Hatchback version. So there won’t be a Honda Civic Type R Saloon? Don’t expect one. There are many variations on the Civic around the world, not all of which come to the UK – for instance, there’s a two-door coupe in the US. But there’s no four-door Type R anywhere at the moment. And since the UK is one of Honda’s biggest Type R markets, we’d be the first to know. The four-door and five-door are very close in every significant way – both are actually quite coupe-like in look and feel – but the Saloon seems to be aimed at slightly older, more traditionally minded buyers, so you can see why the wild Type R would be hatch-only. How much does the Honda Civic Saloon cost? 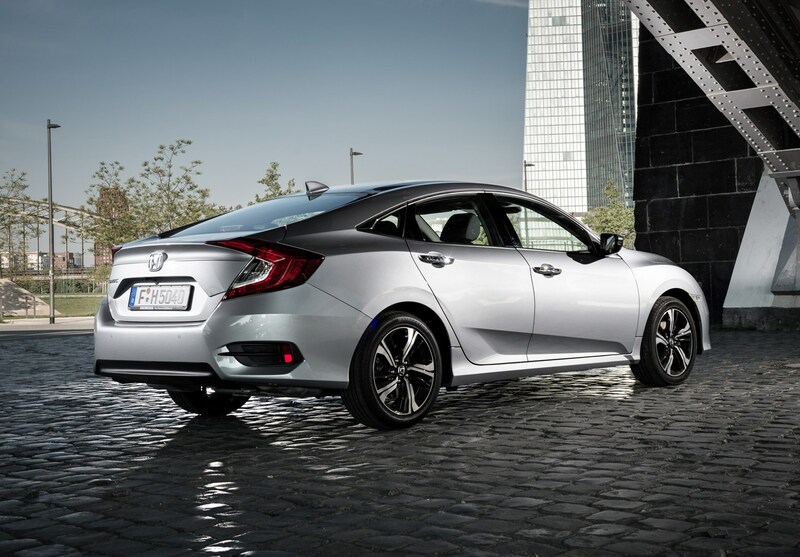 The Civic Saloon starts at £19,395 on the road. That gets you a 1.0-litre petrol version with manual gearbox and entry-level SE trim. SR spec costs an extra £1,845 (that’s £21,240 otr). Top EX spec is a further £2,860 (at £24,100). CVT versions of the same engine start at £20,795 for the SE and go up in the same increments (SR £22,640, EX £25,500). The 1.6 diesel starts at £20,745 for the SE manual, and again increases by £1,845 for the SR (£22,590) and a further £2,860 to go the full EX (£25,450). The automatic starts at £22,415 and follows the same pattern, making the SR £24,260 and the EX £27,120. All Civics come well equipped as standard. 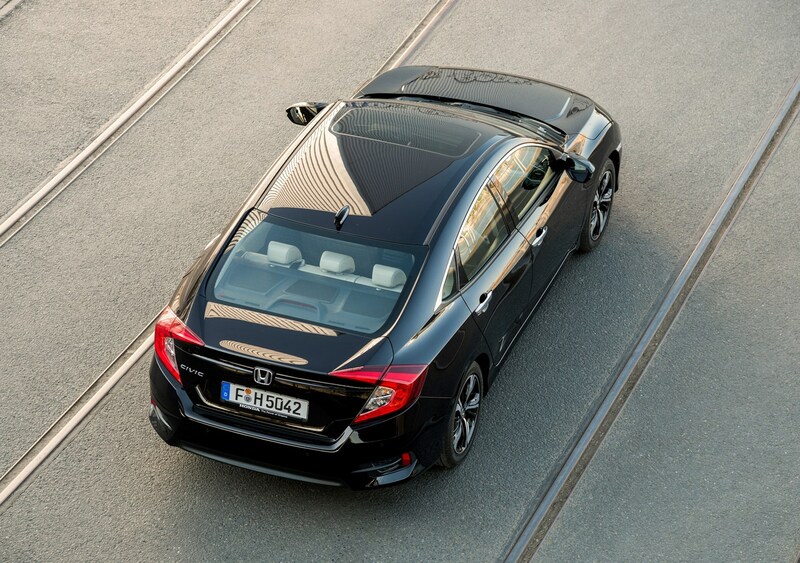 SE spec includes Honda’s entire ‘Sensing’ package of accident–avoidance technology – forward collision warning, automatic emergency braking, lane departure warning, adaptive cruise control and much more – plus a 7.0-inch central touchscreen. Go up to ST and you get automatic wipers, dual-zone climate control, parking sensors and a rear parking camera, plus Apple CarPlay/Android Auto to maximise your smartphone’s compatibility with the car. EX spec brings leather upholstery, keyless entry, LED headlights and more. As with the Hatchback, the Saloon is well equipped but not plush or luxurious. The seats, while supportive and comfortable over long distances, are thinly padded. And the cabin plastics and fabrics are nothing special to look at or to touch. From the front seats forward, the Saloon is near identical to the Hatchback, with only some slightly different finishes reminding you that the four-door is built in Turkey, whereas the five-door is made in Swindon (where, confusingly, the engines fitted to four-door diesels are also assembled). The big difference is between manual and automatic versions of the Saloon: there’s no gear lever for the auto, which simply has buttons (D/S, N, R, P) similar to those in the NSX supercar. Looks odd, works just fine. One of the best things about the current Civic is the six-speed manual gearbox, which has a delightfully short and precise shift action. The version fitted to the diesel Saloon is similarly enjoyable, and makes it easy to get the most from the willing and smooth engine. The Saloon may be slightly less youthful than the Hatchback in terms of image, but it’s very similar in the way it drives (if you forget about the wonderful Type R, which is in a different league). It responds accurately and smoothly to movements of the steering wheel, which has a nicely weighted action. The brakes are smooth and well matched to the engine’s performance. The ride is good for a compact car, although no match for bigger, more luxurious alternatives. As with the Hatchback, the Saloon is reasonably refined, although noise increases noticeably if you push it hard, with some road surfaces causing considerably more tyre roar than others. The buttons on the steering wheel are on the fiddly side, and audio and sat-nav functions operated via the touchscreen are not as intuitive as the best in this fast-evolving field. Which engine should you go for? The 1.6-litre diesel four is best on paper and on the road, where its 120hp of power and 300Nm of torque both come in at usefully low revs. It’s no rocketship, but it makes light work of B-roads, hills, town traffic and motorways alike, and the manual gearbox adds to the driving pleasure. But don’t underestimate the 1.0 petrol triple, which makes a very handy 128hp and 148lb ft, and is of course significantly cheaper. Most of the Civic Hatchback’s virtues, but with the traditional appeal of a big boot and slightly more sober styling.